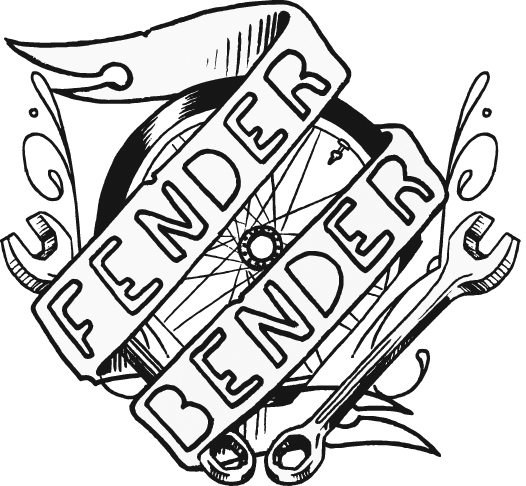 Fender Bender has been “re-tooling” all winter but is “gearing-up” to wheel back into the swing of things starting next month with the announcement of our first Mechanic Training 6 week workshop series, and a Bicycle Lending Library to make its first appearance at Allied Media Conference 2012. More to come on both these projects soon! Fender Bender has also been participating in Detroit Future Media classes. Here, I have been working on a short video that will highlight and uplift the women, transgender, and queer bicycle lovers of Detroit – as riders, mechanics, enthusiasts, advocates or otherwise! Sharing our own voice, stories and perspectives to positively impact and enrich the cycling community of Detroit. Fender Bender Detroit is in a new location all our own. We began our move from The Hub last July, and in Janruary of this year completed the final pieces. The space is being readied for everyday bike shop use. The shop is located at 4605 Cass Ave at the Cass Corridor Commons. The Commons is a collaboration of various Detroit grassroots organizations – some of them long standing – and some of us facilitating our incubation and permanence in the neighborhood. Folks like People’s Kitchen Detroit http://detroitevolution.com/, Whole Note Healing Collective of alternative, traditional and justice based healing/health practices, and YEA! – the Young Educators Alliance. The Commons was formerly the First Unitarian Universalist Church – and still holds service on Sundays as well as other related community events like Felice’s drum circle on Wednesday nights 8-11pm, and the signing circle on Wednesdays at 7pm. The long term goal of The Commons is to create shared space, knowledge, and resources, financial repsonsibilty and accountability to one another under the cooperative principles that guide our relationship to work and community in Detroit. The Commons reflects the needs, wants and imaginations of Detroit and its residents first. EMEAC – East Michigan Environmental Action Council http://www.emeac.org/ inherited the building from the UU. They are a well-rooted and influencial grassroots org of almost 30 years. EMEAC has had a tremendous impact on environmental issues in the city – teaching and learning how to engage Detroit in transforming the environment and quality of life thru personal, civic and neighborhood/community engagement. In alignment with social and environmental principles and practice of EMEAC and these groups -it was a natural fit that Fender Bender would collaborate to see where our grandest ideas could combine and take shape in the future of Detroit. ***We are slowly developing our content and curriculum at a pace that allows for change and sustainability in program, as our relationship with the community grows and contributes their wants, needs and imagination to Fender Bender. One way to assist in this process in by participating in the survey – your input and thoughtful responses are a key ingredient and play a crucial role in shaping the content, program and curriculum of Fender Bender Detroit. What do you want? TO TAKE THE SURVEY email Sarah – fenderbenderdetroit@gmail.com – I will send it to you! That’s all for now! Check back soon for details on how to register for mechanic training classes, and for more info on the bicycle lending library 2012. Be the cyclists you wish to see in the world!